HR Wallingford is working with DONG Energy as part of a project to develop the next-generation of wind turbine foundations. Work underway in HR Wallingford’s Fast Flow Facility will help inform the design of a novel suction bucket foundation, and will ultimately lead to more cost effective seabed foundation solutions for the renewable energy industry. As offshore wind farms move into ever deeper water, developers are exploring alternatives to the traditional monopile foundation in order to reduce costs and keep the technology competitive within the energy marketplace. HR Wallingford is helping DONG Energy refine the design of one such alternative – the suction bucket foundation – as part of a research project to determine how these structures interact with, and impact upon, the hydrodynamic conditions and the seabed. The action of waves and currents can lead to erosion of the seabed around wind turbine foundations. This phenomenon, known as scour, poses a risk to the stability of the foundation and, in extreme cases, has the potential to cause structural failure. Although scour is relatively well understood for traditional monopile foundations, the same is not currently true for complex foundation types. Designs that have been shown to be reliable in the laboratory are likely to be adopted by developers as there is also a requirement for the technology to be proven before its application for use in large-scale developments. 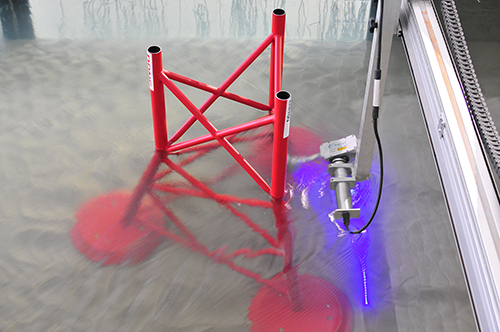 Since launching the Fast Flow Facility at the end of 2014, HR Wallingford has been examining the complex interaction of waves, current and sediments at a larger scale and in more detail than was previously possible, helping clients to optimise designs more effectively and minimise project risks.